How could I pass up a polish with my own name? I must admit Zoya Stephanie isn't the most exciting of color, but to own a polish with your name is pretty special. Stephaine is a very pale sheer pink. It took me about 4 coats to to this point and I think it could use another one. Despite it being not the bright fantastic color out there I really do like it. It's very simple, clean, and sophisticated. Sometimes I can't make up my mind on what color I want to do my nails and these lighter-sheerer colors always seem to call me in those moments. That being said I wanted to pump it up a bit so I added a bit of sparkle! Love My Nails Dazzling is a clear base with iridescent micro glitter mixed in. It's a beautiful layering polish when you're just look for hint of sparkle nothing too dramatic. I really love how this turned out, and I think it's actually one of my favorite combinations. It's very sweet, soft, and I'd even say peaceful. I love owning a polish with my name on it, even if it wasn't made for me personally...lol. Yours is very pretty. I totally understand anxiety. And I know your dentist appointment is a very big deal to you....plan on getting a few texts from me to let you know I'm thinking of ya! I couldn't bring myself to get the one of my actual name cause it was so blah to me but I did end up getting Ginger 'cause my SO teases me for having red hair by calling me a "Ginge"
Very soft and pretty! I'm sure the diagnosis will be 10x simpler and quicker than you're expecting =) think of how much better you'll feel when it's all over. 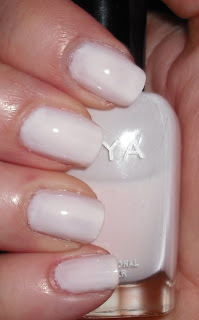 Also, so cool that Zoya has your name as a polish! Mine (Jana) is a little unusual but maybe one day I'll get one too. It looks great on you! Definitely sending you some good vibes. I hope that all goes well.